The MAKO Spearguns Pole Spear Gorilla Grip adds Gorilla like gripping power to your hand while pole spearing. The increased traction for your grip quadruples the length of time you can hold your powered up Big Game Pole Spear. This awesome Do It Yourself Kit includes 14 inches of highly durable heat shrink vinyl jacket and 12 O rings that will make two 6 inch grips or one long 12 inch grip. NOTE: THIS IS NOT YOUR TYPICAL OFF THE SHELF SISSY CRAP HEAT SHRINK TUBING THAT CAN BE SHRUNK WITH YOUR GIRLFRIENDS HAIRDRYER. That stuff tears too easily. THIS IS PROFESSIONAL GRADE, INDUSTRIAL HEAT SHRINK TUBING THAT IS BUILT AND TESTED TO WITHSTAND THE RIGORS OF FIGHTING FISH AROUND ROCKS, RIGS AND REEFS. SO, YOU NEED A REAL HEAT GUN TO INSTALL THIS STUFF. 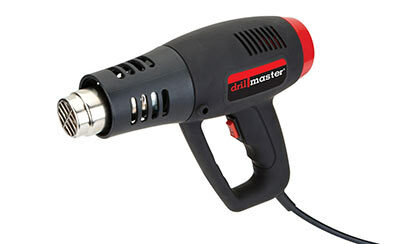 If you don’t have access to a real heat gun, you can order one for about the same cost that you would pay at a hardware store. Just another awesome service provided by the guys at MAKO Spearguns. QUESTION: Should I make my MAKO Spearguns “Pole Spear Gorilla Grip 12 inches long or 6 inches long? Hey Guys, I like my pole MAKO Pole Spear Gorilla Grip to be 12” long and here is why…If I have a fish hiding out in a hole or between some rocks, I don’t want to shoot him with a maximum band pull. Otherwise, my spear could go right through the fish and get stuck in the reef or rocks. At such close range, there is no need to be fully powered. So, I back off on my band stretch. Having the 12 inch long Gorilla Grip gives me the same powerful gripping force, even when not at full draw. Makes two 6 inch grips or one long 12 inch grip. The Pole Spear Gorilla Grip kit includes enough material to make two 6 inch grips, or one 12 inch grip on our Big Game Pole Spear. The grip was very easy to apply and works like a charm! very good idea but the shrinktube didnt shrink as good as i was hoping despite using a commercial heat gun.